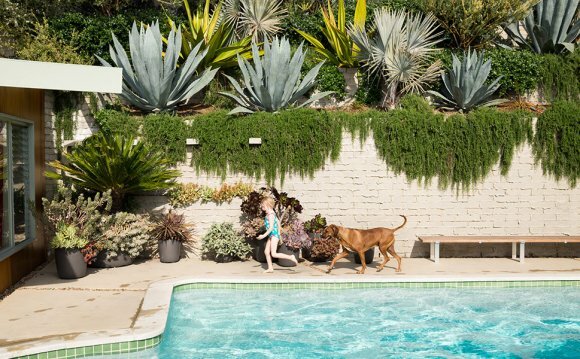 In June of 2013, Eva Knoppel and the Garden of Eva Landscape Design Group were selected by CBS News' Latest Best of LA as one of theFive Best Landscape Designers In Los Angeles. In addition to her work as one of the city's busiest landscape designers and contractors, Eva, when time permits, also serves as a landscape consultant. She is a proud member of the California chapter of the Association of Professional Landscape Designers (APLD). Check out her Residential, Commercial and Urban Landscape Design Portfolios for photographs of her work. For those individuals who want to do it themselves or explore a range of landscaping ideas, but don’t know how or where to begin, she can spend as little as an hour or an entire day helping you learn how to design, build and/or maintain your garden. All consultancy fees are based on an hourly, daily or project basis. If you would like to set up a consultaiton, please contact me at 323-461-6556 or fill out our Contact Information Form and I'll be in touch. Eva Knoppel is founder, principal landscape designer and licensed landscape contractor for the Los Angeles landscape design company, Garden Of Eva Landscape Design Group, Inc.
Born in Arvika, Sweden, she holds a Masters Degree in Molecular Biology from the University of Uppsala. In 1977 she moved to the United States and for 23 years worked as a molecular biologist at UCLA and Children’s Hospital. But her love of plants and gardens overcame her and she traded in her test tubes and beakers for a trowel and garden shears and opened a nursery in Long Beach. A high-end florist shop on Melrose in West Hollywood followed, and in 1995 she opened the Garden of Eva Landscape Design Group, Inc.
She has a husband and three sword-wielding children, all of whom, except for the husband, are champion fencers. I am please to offer Garden Of Eva Gift Certificates for those of you who would like to provide a truly unique, thoughtful and very special gift—suitable for holiday giving or for any special occasion. There are three different levels of Certificates, depending on the scope of the work involved, so if you'd like to see what's being offered, please CLICK HERE.